The International Branch Campus: Cloistered Community or Agent of Social Change? 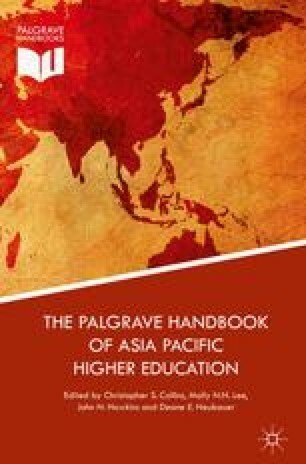 This chapter interrogates the capacity of international branch campuses to act as agents of social change. At the outset, a brief historical overview contextualizes the global emergence of international branch campuses by highlighting contemporary trends and recent exponential growth in the sector. Afterward, institutional diversity is illustrated through six characteristics of international branch campuses, and salient institutional features are encapsulated by three competing definitions. In the final section, the chapter addresses four cultural factors that impact the ability of international branch campuses to realize their potential as valuable locations for cultural understanding and social justice. Admissions & Financial Aid. n.d. NYU-Shanghai. Available online at https://shanghai.nyu.edu/admissions. Accessed 29 Jan 2015. Amnesty International. 2013. Amnesty international report 2013: The state of the world’s human rights. London: Amnesty International. Available online at http://files.amnesty.org/air13/AmnestyInternational_AnnualReport2013_complete. Accessed 29 Jan 2015. Bollag, B. 2006. America’s hot new export: Higher education. Chronicle of Higher Education, February 17, 2006. Available online at http://chronicle.com/article/Americas-Hot-New-Export-/24719. Accessed 29 Jan 2015. C-BERT. 2015. Branch campus listing (Updated January 8, 2015). Global Higher Education. Available online at http://www.globalhighered.org/branchcampuses.php. Accessed 29 Jan 2015. Chambers, G.S., and W.K. Cummings. 1990. Profiting from education: Japan-United States international education ventures in the 1980s. IIE research report 20. New York: Institute for International Education. Available online at http://files.eric.ed.gov/fulltext/ED320488.pdf. Accessed 29 Jan 2015. Dailey, K. 2014. Who on Earth are the Zonians? BBC News Magazine. Available online at http://www.bbc.com/news/magazine-28594016. Accessed 29 Jan 2015. Edelstein, R.J., and J.A. Douglass. 2012. Comprehending the international initiatives of universities: A taxonomy of modes of engagement and institutional logics (Research and occasional paper series 19.12). Berkeley: Center for Studies in Higher Education, University of California, Berkeley. Available online at http://www.cshe.berkeley.edu/sites/default/files/shared/publications/docs/ROPS.Edelstein. Accessed29 Jan 2015. Florida State University. n.d. Republic of Panama summary narrative. Southern Association of Colleges and Schools Prepared Document. Available online at http://sacs.fsu.edu/documents/Republic-of-Panama-Summary-Narrative.pdf. Accessed 29 Jan 2015. Gjorgievska, A. 2013. Yale-NUS students descend on New Haven. Yale Daily News. Available online at http://yaledailynews.com/blog/2013/08/23/web-yheadline-here-16/. Accessed 29 Jan 2015. Guttenplan, D.D. 2012. Parsons to re-open campus in Paris. New York Times, November 11, 2012. Available online at http://www.nytimes.com/2012/11/12/world/europe/12iht-educside12.html. Accessed 29 Jan 2015. Institute of International Education. 2013. Open doors. Washington, DC: IIE. Available online at http://www.iie.org/Research-and-Publications/Open-Doors. Accessed 29 Jan 2015. OECD. 2013. Education at a glance 2013: Highlights. Paris: OECD Publishing. Available online at http://www.oecd-ilibrary.org/education/education-at-a-glance-2013_eag_highlights-2013-en. Accessed 29 Jan 2015. Quality Assurance Agency for Higher Education. 2014. Review of UK transnational education in United Arab Emirates: Overview. Gloucester, Author. Available online at http://www.qaa.ac.uk/en/Publications/Documents/Review-Transnational-Education-UAE-14.pdf. Accessed 29 Jan 2015. Schlosser, C.A., and M.L. Anderson. 1994. Distance education: Review of the literature. Washington, DC: Department of Education. Available online at http://files.eric.ed.gov/fulltext/ED382159.pdf. Accessed 29 Jan 2015. Shams, F., and J. Huisman. 2014. The role of institutional dual embeddedness in the strategic local adaptation of international branch campuses: Evidence from Malaysia and Singapore. Studies in Higher Education, advance online publication, October 9, 2014. doi: 10.1080/03075079.2014.966669. Singapore Ministry of Education. 2010. Yale and NUS in discussion to set up liberal arts college (Press release). Available online at http://www.moe.gov.sg/media/press/2010/09/yale-and-nus-liberal-arts-college.php. Accessed 29 Jan 2015. ———. 2011. Fiscal year 2011 Committee of Supply debate: 3rd reply by Mr. S. Iswaran, Senior Minister of State for Trade and Industry and Education, on “Quality Higher Education with Opportunities for All” (Speech). Singapore. Available online at http://www.moe.gov.sg/media/speeches/2011/03/07/fy-2011-committee-of-supply-de-3.php. Accessed29 Jan 2015. Tierney, W.G., and M. Lanford. 2015. An investigation of the impact of international branch campuses on organizational culture. Higher Education, advance online publication, December 20, 2014. doi: 10.1007/s10734-014-9845-7.